A 6-year-old Florida boy beat up and killed his 13-day-old little sister after their mother left them and their 3-year-old brother in a van on Monday for nearly 40 minutes, officials said Thursday. 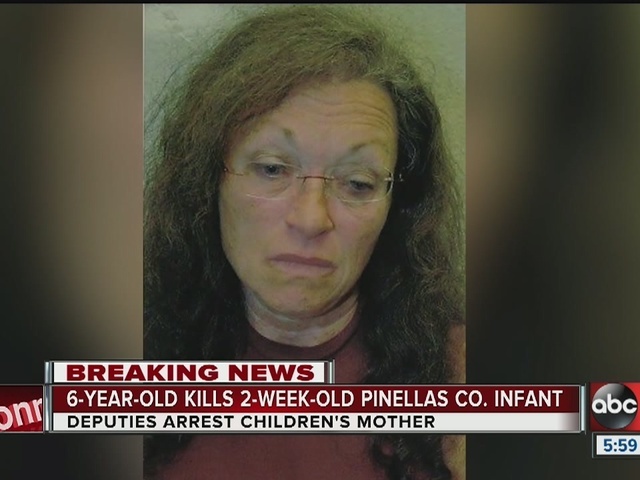 The Pinellas County Sheriff's Office explained in a Thursday news conference the children’s mother will face one charge, aggravated manslaughter of a child, for allegedly leaving the children in the van while she ran errands. Sheriff Bob Gualtieri says the mother, 62-year-old Kathleen Steele, was to blame for the incident. The 6-year-old boy will likely face no charges. Sheriff Gualtieri said the boy admitted what he did and even described what he did to investigators. At just a few days old, Steele dropped her baby daughter, also named Kathleen, while taking her down a staircase during a fire alarm situation at a hotel in Treasure Island. Medical professionals diagnosed her with minor brain bleed. A DCF investigation determined no evidence of child abuse after this incident, and the sheriff says all protocols were followed appropriately. Baby Kathleen was soon released from hospital. Steele canceled an appointment to follow up on these injuries, but rescheduled it for later in August. The baby died before this appointment. Monday around 11 a.m., Steele took her three children to an appointment for baby Kathleen at a pediatrician due to an eating concern, but the pediatrician determined no issues. Steele then took all three kids to run an errand at a cell phone store. Surveillance video showed she left the three children in the van for 38 minutes, said Sheriff Gualtieri. The 6-year-old boy admitted to detectives that he threw the baby around during this time, causing severe trauma to the baby’s head and face. An autopsy determined the trauma fractured her skull in multiple places, and investigators found blood throughout the car. "[He] took the baby, and slammed her like this, slammed her down, slammed her into the ceiling,” said Sheriff Gualtieri. “And he was holding her up like this, and then said he was flipping her, flipping her this and that way, and then she'd fall. So, the way he was describing it, he was tossing her around like a rag doll." The boy said he put the baby back in the car seat, and when Steele came back, he told his mom about the situation, officials said. Steele went on another errand with the kids still in the car, despite baby Kathleen’s condition, to stop at a car rental business. “There’s no mistaking the condition this 13-day-old baby was in,” said Sheriff Gualtieri. Eventually returning home, Steele called a neighbor, a nurse, who immediately called 911 upon seeing the baby’s condition. Monday afternoon around 4:30 p.m., PCSO responded to the Reddington Beach area for a report of a deceased infant. Baby Kathleen, a day shy of two weeks old, was in cardiac arrest. She was pronounced dead at the hospital. The sheriff called the incident one of the worst things he's ever seen in his career – likely his whole life. He said perhaps the most shocking element was that the mother didn’t seem to have any emotional reaction to the situation. Steele told investigators she was planning to have more children before this baby's unexpected and tragic death. Steele’s husband died of cancer in 2011, but prior to his death, he frozen some of his sperm. This is how two of Steele's children -- including baby Kathleen and the 3-year-old boy -- were conceived. Steele's pregnancy with her 6-year-old boy was the topic of a reality TV show called "I'm Pregnant and 55 Years Old" back in 2009. The boy was conceived and born before her husband's death. The show was distributed in 2009 by Discovery Health, per its IMDB page . She told investigators she paid a New York City doctor for the artificial insemination services. 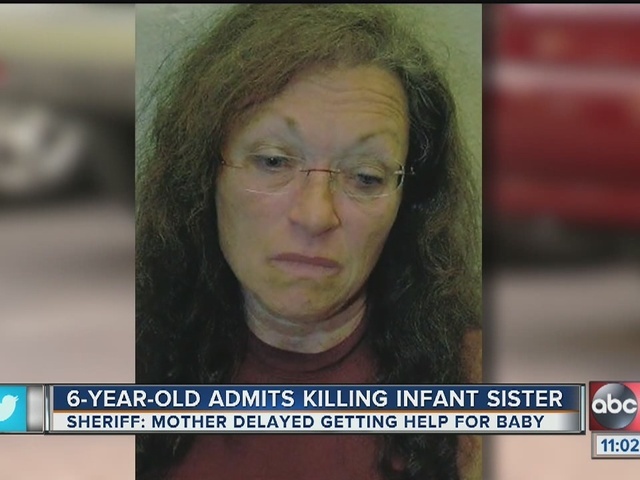 The sheriff expressed concern that a doctor would willingly impregnate a woman of Steele’s age, questioning any process that went into determining if she was fit to be a mother. Sheriff Gualtieri said many of the interviews conducted during the investigation brought into question the mental health of the 6-year-old boy, who is now in DCF custody in a therapeutic foster program. The 3-year-old is also in this program. These foster families are specially trained to be sensitive to these children given the nature of the situation. The sheriff said Steele was “by all accounts unequipped” to have these children in her custody, let alone give to birth to more children.